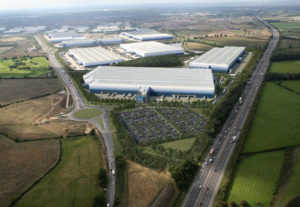 H&M is set to open its 73,000 sq m (785,765 sq ft) distribution centre in Milton Keynes which will service H&M stores in the UK and Ireland as well processing online orders from hm.com, making it H&M’s first omni-channel distribution centre. A deal was struck for the centre in late 2017 on a 20-year lease at a rent believed to be £6.50 per sq ft. An operational launch date is due later this year. The facility will provide increased capacity and will provide the technological foundation to meet the demands of H&M stores and online customers through a fast, flexible and efficient product flow. The distribution centre will have around 800 employees. “We’re very much looking forward to opening a new logistics centre in Milton Keynes. Our customers are increasingly choosing to shop with us in an omnichannel way, so we see this facility as a really important way for us to integrate our online and store operations so that we can meet our customer’s changing needs more effectively,” said H&M UK & IE country manager Toni Galli.